The 8 September 2015 Release of the Halo portal includes a number of enhancements, such as implementing the new Halo interface to the Site Administration screen, unifying Special Events policies with other policies in the Policies screen, and much more. This release enables users to limit a group-level view so that it includes only data from the group itself and not aggregate data from all of its subgroups. To do this, click the Options icon and deselect Aggregate data from descendant groups. The screen reloads with updated data that is specific to the group you are viewing and "Aggregate Data Off" appears next to the Options icon. Note: The selection you make will persist for subsequent logins until you turn aggregate data back on. To facilitate automated naming of server groups, the maximum size of both server tags and server group names has been increased to100 characters. Note: If you are automating group creation by using tag names as your group names, note that tag names can include only letters, numbers, periods, underscores, and dashes, whereas group names can include almost any characters. You may sacrifice flexibility in group names if you choose the convenience of autogenerating them from tag names. This release unifies special events policies with all other policies in the Policies screen to enable users to work with them as they would with any other policy type. Create a special events policy by selecting Special Events from the Policy Type menu in the New Policy dialog. Manage special events policies from the Policy Details sidebar. Import and export special events policies. Clone a special events policy. Retire or delete a special events policy. For more information, see Working with Policies and Working with Special Events in the Halo Operations Guide. As a result of the changes to special events policies (see previous item), Special Events has been removed from the Policies menu. This release implements a notification to clearly indicate when a File Integrity Management (FIM) policy has no active baseline. 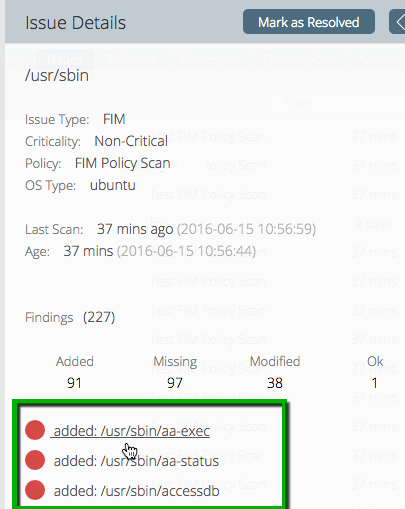 This notification can be viewed in the group-level Settings view under the Policies subtab. Settings that were previously located under the Scanner Settings and Daemon Settings tabs can now be found under the Settings view, which is separated by Agent (Daemon) Settings and Other Controls (see image in next bullet). The agent self-verification setting is now grouped with other Agent Scanning settings. The "Enable Automatic Scanning" check box has been removed. With this release, the act of enabling is implicit when you select a frequency from the Automatically Scan drop-down menu. Selecting Never disables automatic scanning. Master Account settings can now be found under the Advanced view. For complete information about Site Administration settings, see the Site Administration appendix of the Halo Operations Guide. The User and Site Administration screens are now combined. Users now appears as a view button of the Site Administration screen (see image below). For more information, see the Site Administration appendix of the Halo Operations Guide. Note: As a result of this change, the appendices in the Halo Operations Guide have been updated; namely, the User Administration and Site Administration appendices have been combined and user roles is now its own appendix. See Site Administration and User Roles for more information. This release implements the ability for users with an "administrator" role in a group to manage other users within the same group scope. This means that root administrators and account owners can now delegate user management tasks to group administrators. Open a new Scan Results/Server Scan History view. To do so, click the Scans view button to activate the view, then click the Status link of the FIM scan. A Scan Results screen opens that provides details about the scan, including the individual rule checks. Launch a new scan from the new Scan Results page (see next image). To do so, click the Launch New Scan button. Export scan results from the new Scan Results page. To do so, click the Export button to export the results in a PDF. A summary of all passes, critical failures, and non-critical failures. A list of all baseline servers. A details page that describes all of the rules that passed. 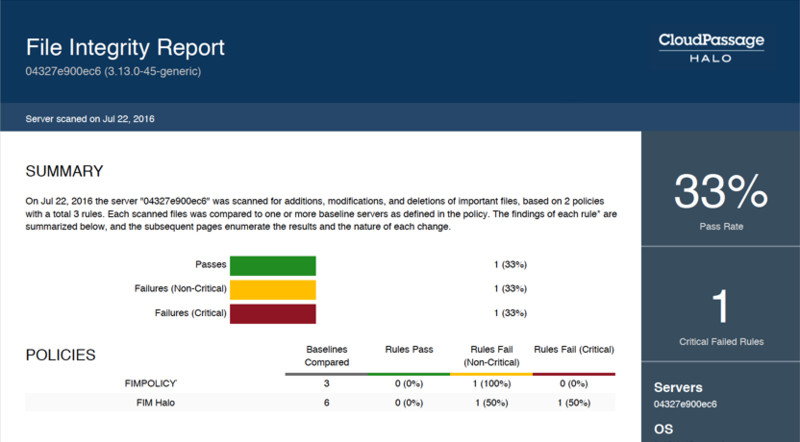 A details page that describes each critical and non-critical failure,including what changed between the scanned file and the baseline. This release enables users to investigate individual FIM rule checks in both the Issues (group and server-level) and Scan Results views. Open a Finding Details sidebar from the Issues view. To do so, open the Issues view. Click a FIM issue to open its Issue Details sidebar. In the Findings area of the sidebar, click an individual rule check (see image below). A Finding Details sidebar opens and provides you with details about the individual rule. You can close the sidebar to return to the Issue Details sidebar. Open a Finding Details sidebar from the Scan Results view. To do so, click the Scans view button, then click the Status link of a FIM scan to open the Scan Results view. Click the left arrow to expand a finding and display the individual rule checks that make up the finding (see image below). Click a rule check to open the Finding Details sidebar. For more information, see Addressing FIM Findings in the File Integrity Monitoring guide. Previously, Halo users were not permitted to delete file integrity baselines that were not assigned to a specific server. The validation has been relaxed to allow for deletion of baselines that either (1) are assigned to an existing server visible to the user, or (2) are owned by a server group visible to the user. View and edit account details from a sidebar. To do so, open a server-level account view and click the account to open its sidebar. To edit, click the Edit button. Activate and deactivate local server accounts. To do so, open a server-level account view, click the account to open its sidebar, then click Activate or Deactivate (the button that appears depends on the current state of the account). See the image in the next bullet for an example. Create a new local account on a server. To do so, open a server-level account view, then click New > Account. Return new account password. When a new local server account is created, a notification appears with the system-generated password. For more detailed information on any of these items, see the section titled Administering Server Accounts from the Server Account Management guide. Previously, PDF exports of older vulnerability scans could potentially show results inconsistent with results displayed in the Halo portal, and both could be inaccurate, because the results displayed could be from the server's most recent scan instead of the requested scan. That issue has been corrected, and historical scan results are now displayed accurately and consistently. Although Halo is not officially supported on Windows Server platforms earlier than 2008 R2, some customers have successfully run Halo on older releases of Windows 2008. Nevertheless, Software Vulnerability Assessment is not compatible with pre-R2 releases of Windows 2008, and vulnerability scans will not run on them. This release enables administrators to enable and disable Traffic Discovery scanning from the Settings view of any server group. Note: This feature is only available for accounts in which Traffic Discovery has been activated. For information about activating Traffic Discovery, contact your CloudPassage account representative. For details, see Enable Traffic Discovery Scanning in the Halo Operations Guide. 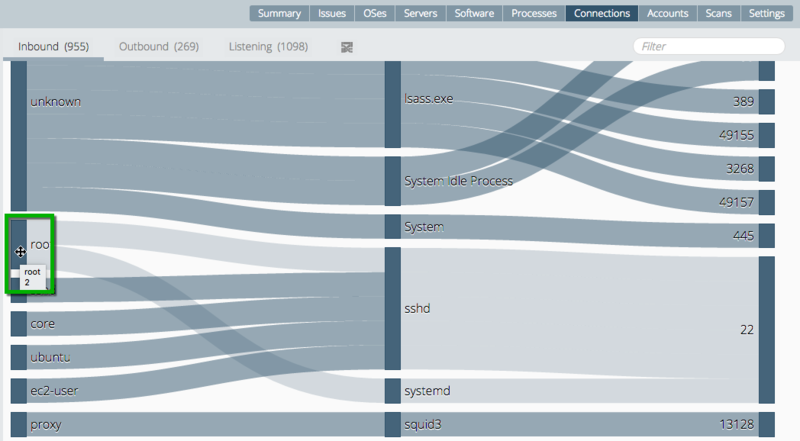 This release enables users add and remove nodes in the Traffic Discovery visualization. 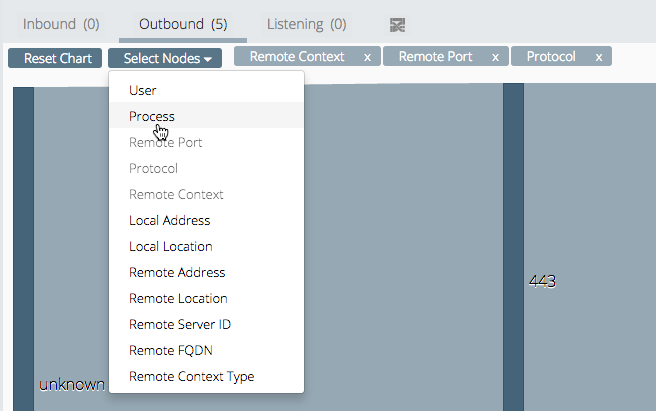 To do so, click the Select Nodes drop-down menu and click the nodes you want the visualization to display. The nodes selected appear next to the menu with an "X," which you can click to remove the node. To change its order, drag and drop it. For details, see Interpreting and Manipulating Traffic Visualizations in the Traffic Discovery Guide. This release implements path highlighting to enable users to clearly follow the connection path from one side of the visualization to the other. To view a connection path, click the dark-blue bar. The full connection is highlighted in a lighter color. Previously, only Traffic Discovery's list view could be filtered. This release enables filtering of the graph view. For more information about filtering, see Filtering Connection Views in the Traffic Discovery Guide. To see the object fields that you can use to filter the graph, see the Filtering Views appendix of the Halo Operations Guide. When a user customizes their Traffic Discovery display settings, this release enables the customized settings to be maintained throughout the user's session and across server groups. Previously, updating a Windows firewall policy could result in network packet loss, depending on the details of the existing and new firewall policies. The issue has been resolved by ensuring that Halo updates Windows firewall policies without resetting the local Windows firewall. On 16 May 2016, CloudPassage announced the availability of a new Halo agent for Windows and Linux platforms. The version number is 3.7.6. For more information, see the Halo Agent Release Notes. On 8 June 2016, CloudPassage released a new version of the Halo agent for Windows and Linux. The version number is 3.7.8. For more information, see the Halo Agent Release Notes. In rare circumstances, rebooting an Ubuntu server or restarting its agent process has resulted in the creation of another agent that duplicates the one being restarted. The issue has been resolved and duplicates should no longer appear. Internal performance improvements have greatly decreased the time required to load and display the group and server Summary views on the Environment screen. Previously, Halo running in a Docker container under certain Linux distributions (such as CentOS 7) displayed a server's Docker bridge address instead of the server's primary IP address in the primary_ip_address field of the Server object, and in the IP Address field in the Halo portal. The issue has been fixed and the proper IP address is displayed. In certain Halo accounts, links to the File Integrity Monitoring and Log Based Intrusion Detection dashboard pages have been non-functional. The links have been restored. A new Halo REST API document is available online at: https://api-doc.cloudpassage.com. Note: The REST API document on ZenDesk has been deprecated, so please update your bookmarks to the new URL. For your convenience, the API document in our private Documentation Library will continue to remain available—the content between that document and the new site are the same. The REST API documentation on ZenDesk has been deprecated and replaced by the new Halo REST API Documentation at https://api-doc.cloudpassage.com. Please update your bookmarks. Traffic Discovery: Servers column may have inaccurate counts. In the group-level list views for inbound, outbound, and listening connections, the Servers column displays, for each connection listed, a number that is intended to be the count of servers that have that "same" connection, meaning the number of servers that have a connection with the same core attributes. That number can be incorrect, because it actually reflects the total number of connections with those attributes, not the total number of servers. It is possible in some cases for a server to have multiple connections with identical core attributes, in which case the reported count will be higher than the total number of servers with that connection.